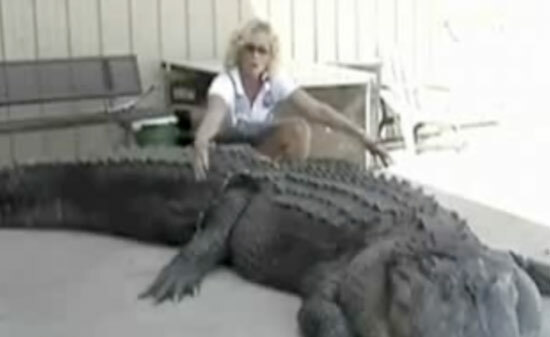 A 900-pound gator was caught in South Carolina by a Massachusetts woman using her fishing pole. Mary Ellen Mara-Christian lured in the 13-foot-long alligator while she was hunting on Lake Moultrine with her husband and friends on Wednesday, according to a local NBC affiliate WYFF Channel 4. Mara-Christian was intentionally trying to lure the alligator, as South Carolina has a one-month-long hunting season for gators. “He was right there at the edge of the bank swimming on the edges,” Mara-Christian told WYFF 4. After hooking the gator with her fishing pole, she spent two hours luring it in and then shot it eight times before stabbing it to finish it off. A separate report from the Associated Press lists the gator at 1,025 pounds and 13 1/2 feet long. The dead marine reptile was taken to a meat processing factory, though only about 40 pounds of meat were reportedly usable. The alligator will be stuffed for display. Obama Shakes Hand With Horse Head!